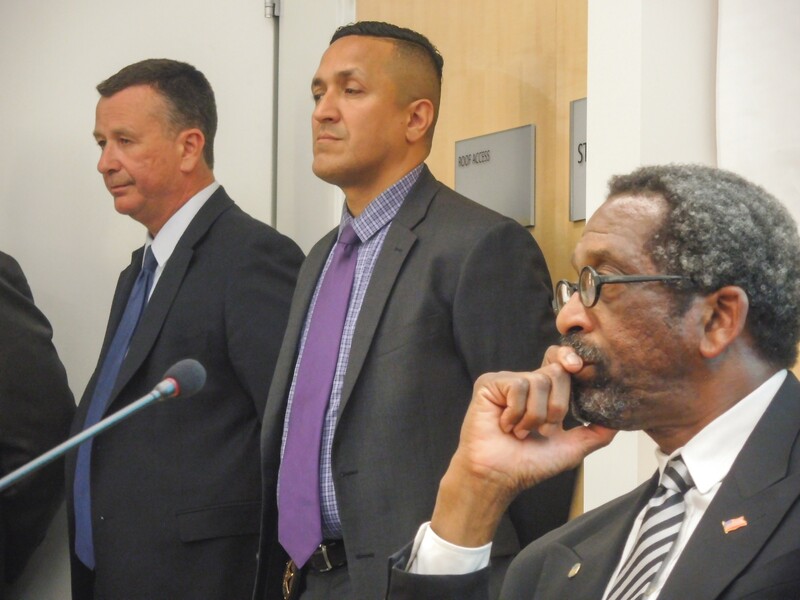 Is Alameda County's Sheriff Reaching Too Far? The sheriff's growing role in health care, arts, recreation, and economic development is drawing opposition. Alameda County Sheriff Capt. Martin Neideffer; Lieut. Miguel Ibarra, Alameda County Sheriff’s Office Youth and Family Services Bureau; and Alameda County Supervisor Nate Miley at a recent meeting in San Lorenzo. For years, police have been criticized for not being invested in the urban communities they patrol. Officers — many who live in distant suburbs — clock in, make arrests, and clock out. They typically focus on street crimes, and that usually means arresting large numbers of low-income people of color and funneling them into the court system where their lives spiral in a process of further criminalization, unemployment, and incarceration. The metaphor used by critics is that it's war. Cops are "warriors" who occupy communities of color. Trust between police and the community is the first casualty. Alameda County Sheriff Capt. Martin Neideffer wants to change this dynamic. For the past 14 years, Neideffer has been building something unusual in American policing. The sheriff's Youth and Family Services (YFS) Bureau is a combined economic development, mental health services, job training, and counseling provider. Along with the Deputy Sheriffs' Activities League (DSAL), a nonprofit affiliated with the sheriff's office, the YFS Bureau even runs community farms; soccer, basketball, and boxing leagues; and a Friday-night market with live music and vendors. Most of these programs are located in the county's unincorporated communities of Ashland and Cherryland, wedged between San Leandro and Hayward. Now, with the support of county Supervisor Nate Miley, the sheriff's office hopes to take over management of the REACH Ashland Youth Center. Currently operated by the county's Health Care Services Agency, REACH offers free education, arts, counseling, and sports programs for youths ages 11 to 24 at a modern building on E. 14th Street at 163rd Avenue. But the plan has run up against significant opposition. Many are worried that the sheriff's takeover will expand law enforcement's role too far into sensitive areas like health care and education. Opponents also say that many people, especially undocumented youth, will feel unsafe around police. So far, Miley has said little about why the change in management is needed. He only unveiled the plan in December in a letter to his colleagues on the board of supervisors. The controversy has also grown to more than just a discussion over who should run REACH. It's now also a philosophical debate about the role of police in society. "There's nothing wrong with officers wanting to be involved in the community," said Darris Young, an organizer with the Oakland nonprofit Urban Strategies Council. "But at the end of the day, law enforcement is still an enforcement arm and not something that should be providing services like mental health and youth counseling." Young said the sheriff's office and DSAL do good work, but he worries about law enforcement taking over too many services and thinks a healthcare nonprofit or other branch of government would be a better fit for REACH. At a forum last week in San Lorenzo, two nurses from La Clínica de La Raza, which provides healthcare services at REACH, said some of their clients, including undocumented youth, told them they'd avoid the center if the sheriff takes over. Neideffer and his team disagree and believe they have the community's support. About 300 parents, many of them Latino immigrants, already signed a petition supporting the sheriff's management. Some of these parents said at a recent forum that the sheriff's takeover is necessary because they worry about the safety of their children even while they're at the center. Meanwhile, Rev. Arlene Nehring of Eden Church, located in Ashland, has gathered about 250 signatures of local parents and youth who are opposing the sheriff's takeover. Nehring said that distrust of law enforcement is widespread among the area's undocumented community. About 9,000 of Ashland's 24,000 residents, or 40 percent, are immigrants, and 5,300 are not U.S. citizens, according to census data. Aisha Knowles, a trustee of the Alameda County Office of Education who helped establish REACH, said Miley's proposal caught everyone by surprise, and that he's yet to explain why the center should be taken away from Health Care Services Agency. But everyone agrees on one thing: REACH has become a vital resource for Ashland and Cherryland. "This is about process," Knowles said. Neideffer, who dons business suits instead of a sheriff's uniform, looks as much like a social worker as a law enforcement official. He grew up in Ashland and remembers what it was like 40 years ago. There used to be bowling alleys, drive-in movie theaters, and pools. The commercial strips along E. 14th Street and Lewelling and Hesperian boulevards were vibrant. Families were upwardly mobile and most owned their homes. All that disappeared after middle-class white families moved to the suburbs and the unincorporated areas became heavily Latino and Black, working-class, and subjected to high rates of unemployment and discrimination. Crime rates increased, as did public health problems like drug addiction and homelessness. The result was a drain of capital from the area. Its institutions disintegrated. "REACH is the best thing to happen to that area in 40 years," Neideffer said at a meeting last week. In the past, most police-run youth programs were a way for officers to do some good in their off time. The underlying theory promoted by law enforcement was that kids need to be kept away from the streets where drugs and gangs lurk. But Neideffer's team has concocted a model that goes far beyond this basic theory. They call their approach "community capital policing": It involves an expansion of law enforcement into every sector of society to rebuild financial, cultural, human, social, political, and natural capital. The YFS Bureau sees itself as a catalyst that can create small business opportunities and build up a household's financial capital. The sheriff's Dig Deep Farms program, for example, involves locals manufacturing produce into specialty foods. To increase "natural capital" in Ashland and Cherryland, the sheriff's office talks about protecting natural areas and clean water, and fostering "high levels of biodiversity." In a presentation last week, Sheriff's Deputy Charles Joe said they've organized ballet folklórico classes to teach traditional Mexican dance to children. The goal, according to a slide presentation, is to promote "strong ethnic identity and positive attitudes toward other groups." At times, sheriff's staffers sound like protégés of Saul Alinsky or the Brown Berets, organizing in the streets not just to fight crime, but to build political agency among the oppressed. "We are empowering the youth that we serve," said Joe. "Community members from traditionally marginalized groups now can feel confident in how and exactly what steps to take in order to affect the civic process." The sheriff's office also aims to increase a community's political influence by facilitating "opportunities for civic involvement" and "easy access to powerbrokers" and even advocating for an "unbiased media." This hearts-and-minds strategy elicited one critical comparison to U.S. military counterinsurgency programs at last week's community forum hosted by Miley. White of the Urban Peace Movement said the community capitals model is a "very political" move by Sheriff Gregory Ahern, who is elected by voters and is clearly seeking legitimacy among people in the unincorporated areas by becoming a service provider who offers far more than traditional policing. "It's going to frighten off folks," said White about the prospect of the sheriff running the REACH center. "If you're undocumented, if you have prior convictions, you won't want to use it. So, programs will suffer." He argued that any kind of contact between law enforcement and Black and Latino people can result in a harmful outcome. The solution isn't necessarily more positive interactions, but instead fewer overall interactions, he said. When asked at a board of supervisors meeting two weeks ago about his reasons for wanting to switch oversight of the youth center from the Health Care Services Agency to the sheriff, Miley was cryptic. He vaguely referred to "dirty laundry" that he didn't want to "air," but he declined to be more specific. Miley also said that the Health Care Services Agency no longer has access to one-time funds, including money from the county's tobacco litigation settlement and former redevelopment agency money, to make up for a multimillion-dollar budget gap. The sheriff's office didn't commit to filling this deficit, though. When asked about it, Undersheriff Richard Lucia said his agency would also have to "live within" whatever budget they're given by the county supervisors to run REACH. He added, however, that DSAL could raise money on its own from foundations. The county's Health Care Services Agency leader Rebecca Gebhart wrote in an email to the Express that her agency is "extremely proud of the work that the REACH staff have done over the last five years operating the youth center," and that they plan to make a presentation about their work at a future meeting. Knowles said that, for her, the process needs to slow down, and there should be hearings about REACH's accomplishments and problems without bias toward a particular solution.